It has been more than 48 hours when more than 120 Pakistani Soldiers and some civilians where buried in a Avalanche On Siachen Glacier. Even after 48 hours the search for troops continues by rescue team. 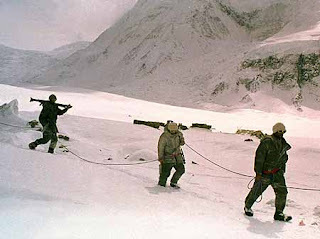 More than 200 Pakistani Army soldiers, Doctors, Engineers are taking part in the rescue operation. According to experts the chances are very less that these Soldiers will be still alive due to nature of Avalanche that hit the army camp. Pakistan Army Spokesman Major General Athar Abbas has asked Pakistani Nation to pray for the soldiers that are buried. Following is a report by AP on this incident.